Someone posted this on a Facebook Group I belong to - but I thought it was worth sharing here as most started coming here to share my love of cross stitch. Government officials, or insurance companies. No, not even Blue Cross/Blue Shield! Cross Stitching is a Disease! Just as a drug user becomes addicted to his drugs so does the stitcher become addicted to her habit. Just as the drug addict requires more and more and specialized designer drugs so does the stitcher need more and more and specialized designs. And just as the drug addict will do anything for his next dose, a stitcher will indeed do anything for her next fix. Point 1. When my research began, I started with Aida fabric and cotton floss. Simple basic x’s on simple basic designs. Then one day I was offered "evenweave" and then linen. 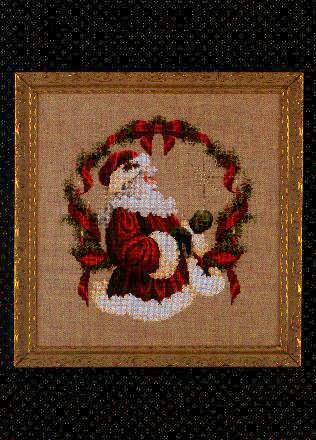 Metallic thread was blended with the cotton threads and beads were added. Before I knew what was happening I was slipped "quarter stitches", "French knots", and the dreaded "lazy daisy". The progression was so slow that it was hardly noticeable until at present it is now hand-dyed fabric, silk threads, delica beads, specialty fibers, specialty stitches and quite challenging designs by ladies such as the Queen of the Blended Threads and the Chatelaine of the Gardens. Point 2. When my research began, only those things were bought that were needed at the moment. But gradually things were purchased in advance of need. It was called "kitting" up a design. Then slowly one kit became two and three and more. Suddenly, without prior knowledge, the dresser filled and then the closet became full. Before long the spare bedroom became a stash room. Soon it became hiding packages from the spouse so he wouldn’t know just how much was spent. And now it is trying to see what can be sold to purchase more stash. My biggest concern is what will be next? Just like the drug addict, a stitcher must have her next fix! Point 3. In order to relieve a stitcher from the burdens and stress of her addiction she must undergo extensive and exhaustive therapy. Usually this therapy is very expensive and not 100% effective. Like the drug addict, it is very easy to revert to old habits. And most stitchers feel that the treatment is worse than the problem. 1. I find that Cross Stitching is undeniably a disease and should be added to the Physicians Desk Reference as such. 2. There is no cure. 3. Although there is treatment for this disease, it is expensive and not often successful and therefore, most patients prefer to abstain. 4. Once diagnosed with this disease, employers, family members, and friends should be considerate of the stitcher’s needs and avoid confrontation and criticism. A disease that I certainly can live with !!! Now to convince my insurance to cover the 'drugs' required to treat this! As with buying wool (or dolls secondhand to fix the hair - yum and to dress) I always advise to buy the best quality one can afford. After all, a x-st kit of 100 dollars is able to keep a woman for weeks in a row of the street, out of the bar and away from handsome man, the last one is to convince the spouse the expense is wholly advisible! In my part of the world, Netherlands, women with this disease and a purse of onionleather (that is, your eyes start watering every time you look for money in that purse) have gone to the ultimate step of feeding their need: advertising - for free - to finish a xstitch project for a small fee for somebody who was hit by the virus, but succesfully avoided the disease. So they earn some money to buy a new project, disease indeed, but as long as I fit into my own chair in the bus and my house is reasonable clean (not hospitallike, mind you) there is food on the table and clean washing in the closets, it is OK with me, I do not force anybody to inhale smoke from cigarettes, inhale perfume from yards away or drive too fast, while textig or having consumed alcohol, I am in my chair and stitch, bothering nobody. It is a quiet, harmless disease, except maybe from the closets full of kits and those full of finished works. My mum crossstitched until she was 104, then she decided to stop, she felt happy with her disease.